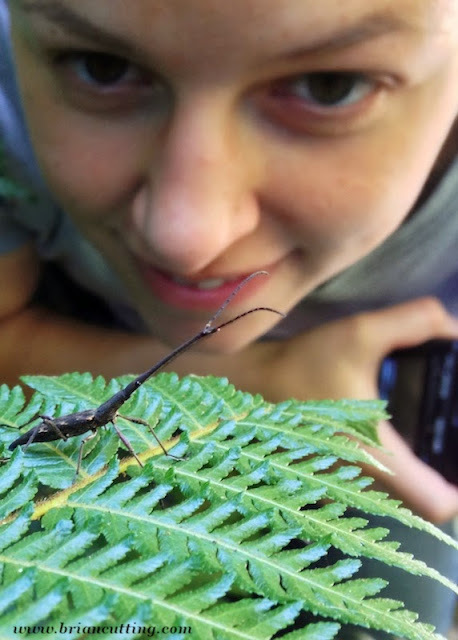 A New Zealand Stick Insect, probably in the genus Acanthoxyla. 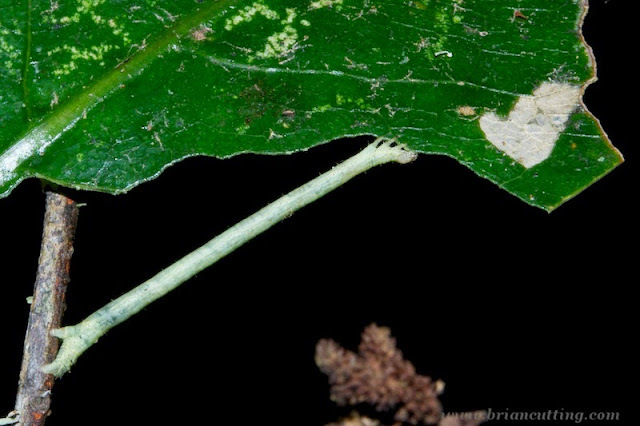 All species in this genus are entirely parthenogenetic; populations consist only of females that reproduce asexually. Moving to a new part of the world is a big adjustment, and perhaps particularly so for a biologist. Getting used to the New Zealand culture has been a minor adjustment, but finding myself surrounded with species and ecosystems that are mostly unfamiliar to me has been a much bigger change. For me, a walk through the woods, or 'bush' in New Zealand is a bit like reading poetry in French (Je ne parle pas français). I know that it is beautiful, and recognize things here and there, but still have a lot of learning to do to fully understand what I am seeing. A male sheetweb spider in the family Stiphidiidae. 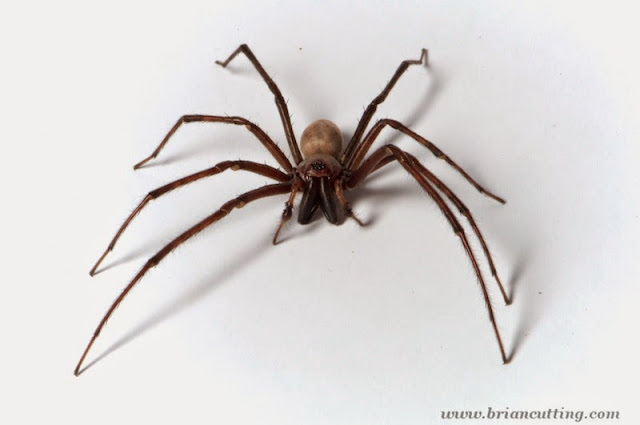 These can be quite large spiders, the leg span on this one was at least 6 cm, and... wow! Hey there, mandibles! New Zealand has a number of amazing spiders (more of those on the way!) Some of the most impressive are the sheetweb spiders. They are quite common in bush fragments with native plants. Their complex webs are often seen at the bases of large trees, with the spiders hiding out nearby during the day. This large sheetweb was found high up a tree by a researcher climbing in the canopy. They can be a bit startling at first, but of course, I find them quite beautiful! 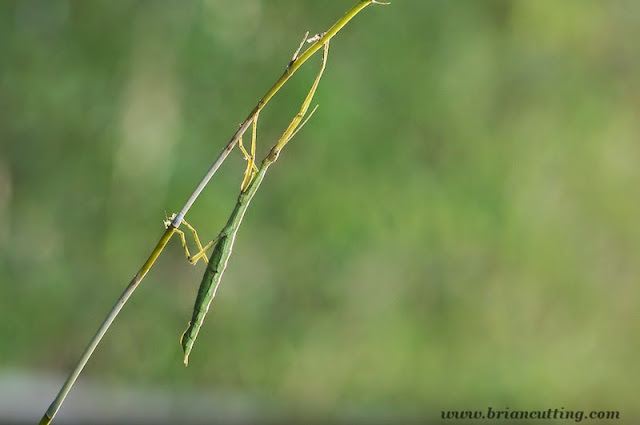 As we've discussed previously, many caterpillars are 'masters of disguise,' hiding themselves from hungry birds and other animals that would like to find a high-protein snack. The moth family Geometridae are the best of the best when it comes to hiding in plain sight, and a number of the new Zealand fauna are excellent when it comes to pretending to be a stick (although the stick insect at the top of this post may give them a run for their money). Not all animals take the hiding approach. This lovely yellow terrestrial flatworm isn't hiding from anybody - and I suspect that the bright color would be followed by a nasty taste, although I didn't have a bite to find out. 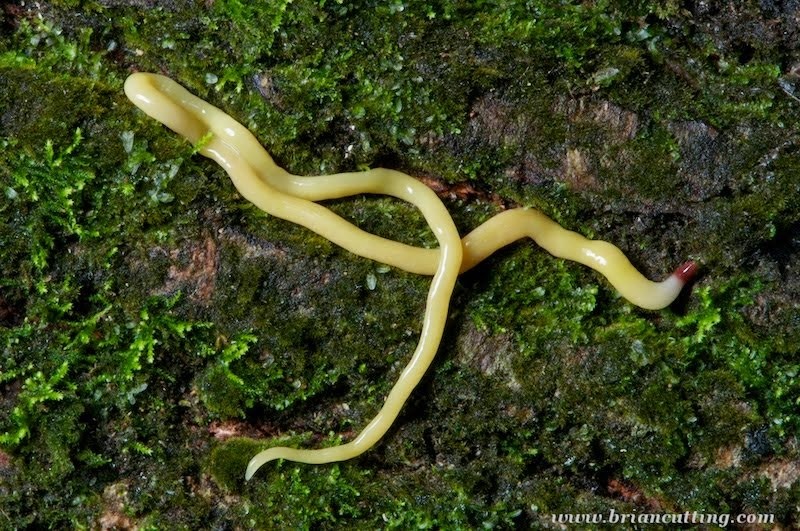 A bright yellow terrestrial flatworm, around 15 cm long. Terrestrial flatworms are predators; they eat other invertebrates including slugs and earthworms. I haven't been able to find out much about this species, but it may be an introduced species from Australia. The New Zealand Giraffe Weevil Lasiorynchus barbicornis (Brentidae) is worthy of attention. They can be over 8 cm (3 inches) long! These beetles have extreme sexual dimorphism; the males are much larger than the females. These males fight each other for opportunities to mate with females, with the largest males usually having the upper hand. However, there is a notable exception to the rule: the male pictured here is relatively small: closer to the size of a female than to a large male. Rather than being a fighter, this male is probably a 'sneaker' who will mate with females without being noticed by large males, even if they are mating right under their (long) noses. This method of circumventing that seem to be the normal rules of engagement is what biologists call an 'alternative mating strategy,' and similar sneaking behaviors have been recorded in many animals from insects, to fish, to orangutans. 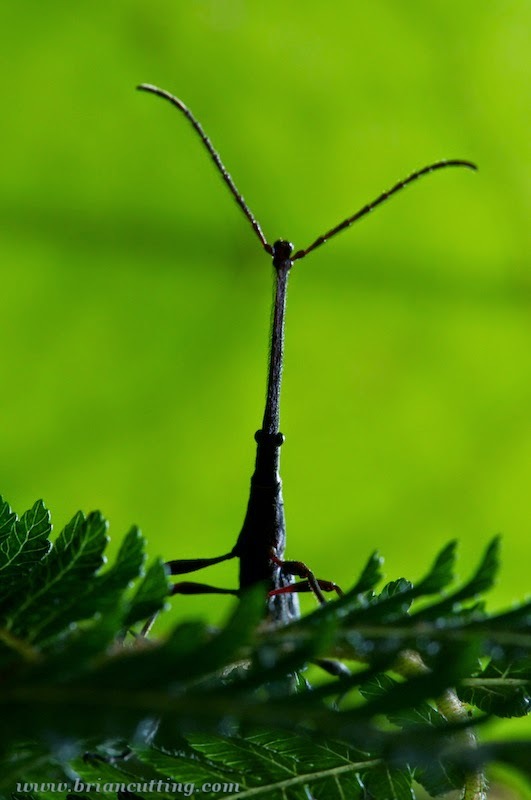 It would be really cool to know if the smaller males have similar success rates to larger males when it comes to fertilizing eggs; for many insects, the act of copulation is only half the battle when it comes to passing genes along. More adventures in Aotearoa to follow! I agree completely with the sentiment of having to adjust to a place where the flora and fauna are unfamiliar. I have recently been on a trip to Norway and felt very lost - almost uneasily so - in the forest because there was so much I didn't recognise. In NZ the bush I feel like I'm in the company of friends because I 'know' the trees. Great photos too. I am particularly fond of the spider. I can study all I want, but I don't think I'll ever know a place in the same way I know the place I grew up - I'll probably never be able to watch a slug for 2 hours for no reason like I could when I was 5. Then again, I think that sometimes 'new eyes' let people notice things that the locals may overlook as common. I'm glad you enjoy the photos Jarrod! That's very kind of you, thank you Marie-Claude!